The end of the year can be a busy time, but it doesn’t have to be disorganized and leave you frazzled. With the help of this checklist, you can better ensure you are on the right track to a smooth, positive end-of-the-year experience. Checklist items and tips are divided into four categories: general considerations, what you can do in preparation for the year-end, year-end processes themselves, and what to do after the process is complete. For further reference, check out SkyDoc for in-depth documentation of student processes, ranging from state-specific instructions to year-start and year-end procedures. ↪ Download the printable checklist. Complete all data entry and corrections prior to year-end processing. We recommend that you have two complete backups of your Student system prior to completing year-end processing. Keep one of these data sets offsite. Consider disabling automated emails for events such as "anytime a new student enters" to avoid overflow of e-mails. When running the actual Year End Wizard, always pay attention to the year at the top of the screen to make sure it is the year you are closing out. Year-end processes can be run at different times for each entity, based on when they are ready to run. It may not be necessary to perform all the year-end processes for all entities. Keep in mind that District Year End (000) should always be run last. Save report cards to the Portfolio tab. 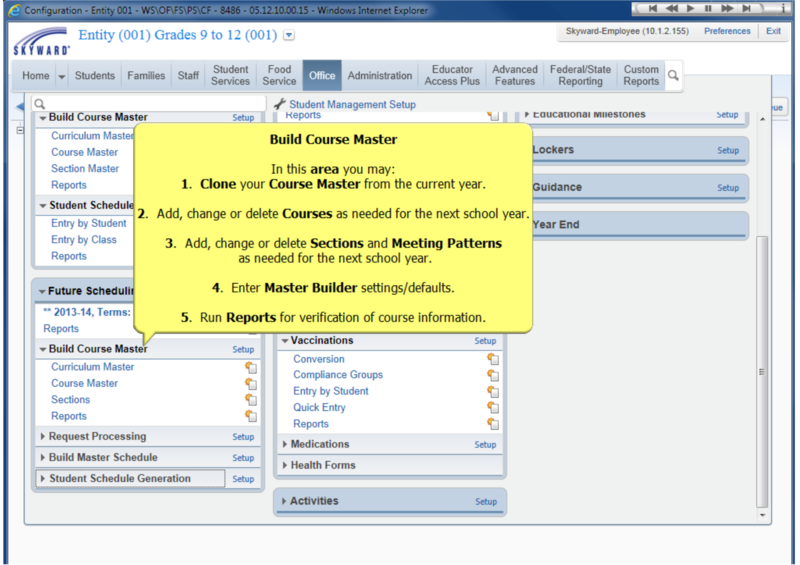 Doing so will enable you to print report cards after the year-end process is complete. Run a current Student Rank report. Use the information to update the Student Master List. Mark the seniors who are graduating as “Yes-Graduated” and enter their graduation date on the General #1 tab. If you choose not to mark them as graduates, a default will be set during year-end processing. This information can be changed at a later date. Complete the Future Scheduling process and carry out an Actual Auto Scheduling run. Once these steps have been completed, all scheduling will need to be done in Current Scheduling. There is, however, an option on the Scheduling Entity Year Setup screen that will enable you to continue working in Future Scheduling after year-end processing is completed. It can be turned on after Year End/ Start has been run and should be turned off again once the campus is finished with Auto-Scheduling. To enable this feature, choose the “Allow Current Year Scheduling” option. Mark students for retention. If retained students have been pre-enrolled at another entity as part of Future Scheduling, you will need to manually remove those records. If you do not, year-end processing will re-enroll these students at their current entity. Mass-add students to a new entity. Run this step even if it was completed as part of Next Year Scheduling to ensure that all students from a feeder school have been enrolled in the new entity. Also ensure that any scheduled tasks set with Mass Add are disabled. If your school has students on an AM or PM calendar, such as pre-K children that are switching to a full-day calendar, withdraw and re-enroll them to the new calendar. Switch any staff members that will not be returning to ‘inactive’ for the new school year. Ensure Grade/ Grad Year Cross is set for the new year. Consider checking how many years it is cloned out for. Carry out supplemental year-end processes such as food service, fee management, and special education. 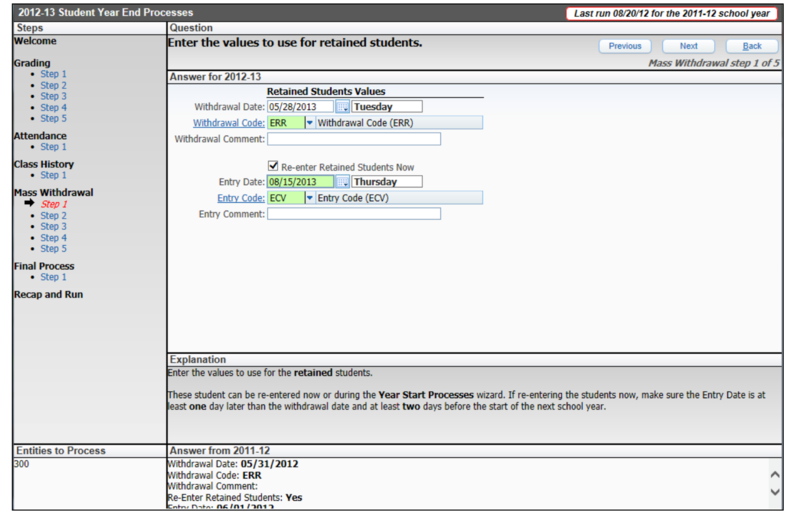 These processes can be done before or after the end of the student year-end processing. Complete any state reporting that must be finished prior to the year’s end. You can find instructions specific to your state in SkyDoc. Inform all Skyward users of the date and time when you will run the year-end process. 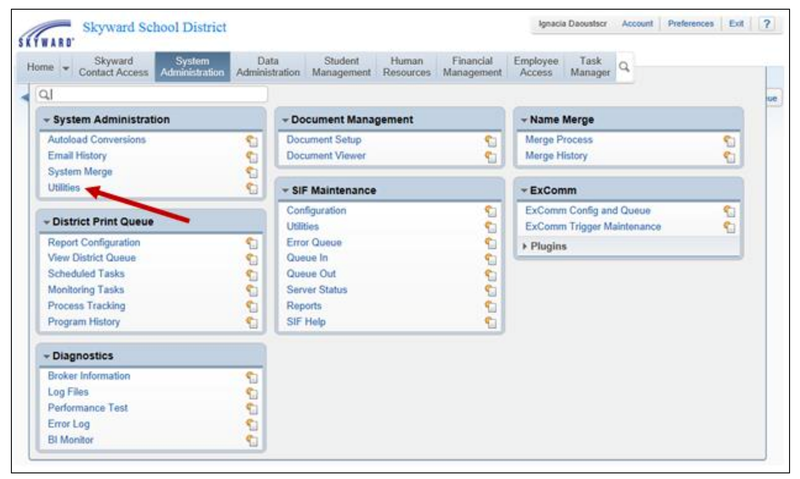 Consider sending an email, using the district newsfeed, or putting a message on the login page alerting users that you will need to lock them out of the system while year-end processing is underway. Enter the Student Entry Date (first instructional day) for the upcoming school year. If you are unaware of the date, pick a date prior to the first day of school. This date can be changed at a later time using the Mass Change Date Utility. Be consistent with the date you choose, however, because this utility can only correct one date at a time. Enter the Student Withdraw Date to be used when mass-withdrawing students (for example, 06/07/16). Once again, if you do not know the withdraw date, be consistent with the date you choose. Unlock the system when processing is complete. Reactivate scheduled tasks with the new appropriate start date. You may also want to revisit other established dates to ensure they are correct. Determine the visibility of important information. 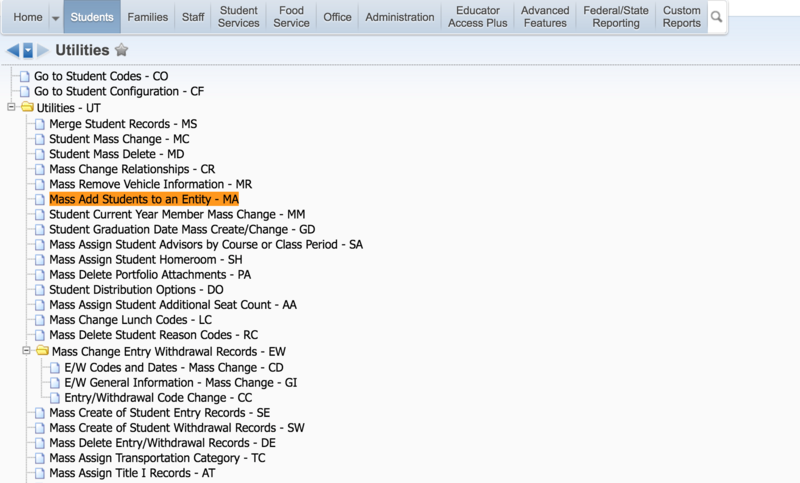 Within Student and Family Access, set visibility for information such as schedules, homerooms, and teachers. Consider temporarily disabling teacher access if you do not want teachers seeing their classes and students prior to a certain date. If you are using the Future Scheduling tools, ensure “Use Current Year Scheduling” is enabled and that the correct year is selected. Use the First Day of School Checklist found in SkyDoc to ensure all items are complete for the start of the new school year. We hope these steps and tricks will help you simplify your year-end processing. If you need further assistance or get stuck at any point in the process, don’t hesitate to reach out to us. We are always just a phone call (or a click) away.